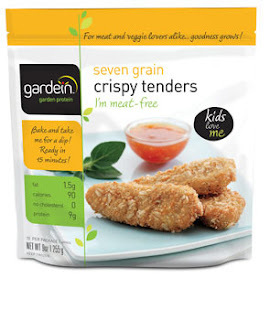 Gardein Seven Grain Crispy Tenders are a meat-free alternative protein source. Each serving contains 100 calories, 8 grams of protein, zero cholesterol and zero Trans fat. I am slowly trying to introduce meat less products to my family. It has been a battle with many brands because they know immediately that the product isn’t real, but with Gardein my kids loved the product. My kids never once questioned if it was a meat less dish, and they even ate seconds. To my family they taste exactly like chicken fingers. You wouldn’t know that they are meat-free by their taste and texture. I baked them in the oven on 430 degrees for about 10 minutes on each side and they came out crispy. I think that’s probably key to the crispy chicken tenders coming out like real crispy chicken. I really liked the fact I did not need to deep fry them as I’ve found that other brands come out soggy even after cooking them in the oven on high temperature. Overall I am extremely satisfied with the product and would feed my family Gardein products in the future. >Ooh, thanks for sharing this brand, Emily. Since being on Nutrisystem, I'm always on the lookout for brands that are healthy. I like the idea of being able to get chicken tenders because that was one of my favorite foods prior.